asistencia of police owing to wordo ask diadomingo 1.15 of madruga, at one cas at savaneta, at height of botica aloe, where one inhabitant owing to see 4 boy, owing to steal in cura of his neighbour. n’e cas the witness is tell police cu past owing to follow they slow, but not owing to succeed alcansa they. police owing to busca in becindario, but not owing to come across cu they. one rato after, more in madruga, police is achieve three bicycle, more three schroefdraai y one pins, near of keep of police at savaneta. tuesday afternoon owing to enter informacion cu one choler female owing to destrui one car staciona y owing to ataca one security female. at arrival police n’e sitio, owing to constata cu the choler female have one chop at his cabez, but also owing to constata cu one security female had one mordi at his hand y was bleed. the guardia of seguridad owing to give we one relato of the susedido, where the choler does not owing to follow the instruccion of the security y owing to arise contra dje y owing to bay atake y also owing to destrui the windshield of one car staciona in schelpstraat. ambulance owing to present y acompaña for police owing to take away the choler for hospital. while owing to conseha the guardia p’e bay poli y after happen at despacho of recherche cu the declaracion medico of the maltrato. tuesday in oranan of madruga one thief owing to los the shutternan of xavier university school or medicine in paardenbaaistraat for enter y steal. during cu the was in the lugar is steal, the anti-social here owing to feel cayente y owing to hay’e is bandona the lugar in pura lagando his bisicleta behind. besides his vingerprint also owing to stay behind, now the owner or esun encarga cu the lugar have to work one list of locual owing to being steal. police is investigando the caso here. presencia of police owing to wordo ask monday 2.20 of afternoon at one cas at rooi afo, for one hincamento cu sambechi. hour cu police owing to arrive n’e sitio, they're talk cu the muher owing to.m of 29 year, that is tell police cu during one discusion cu his amigo the.r., that all hour is maltrate, past owing to hinke cu one sambechi. police owing to talk cu he, y the is tell cu the does not bay take tratamento, neither niether the is give complaint contra owing to.m. apparently all two is drogadicto. 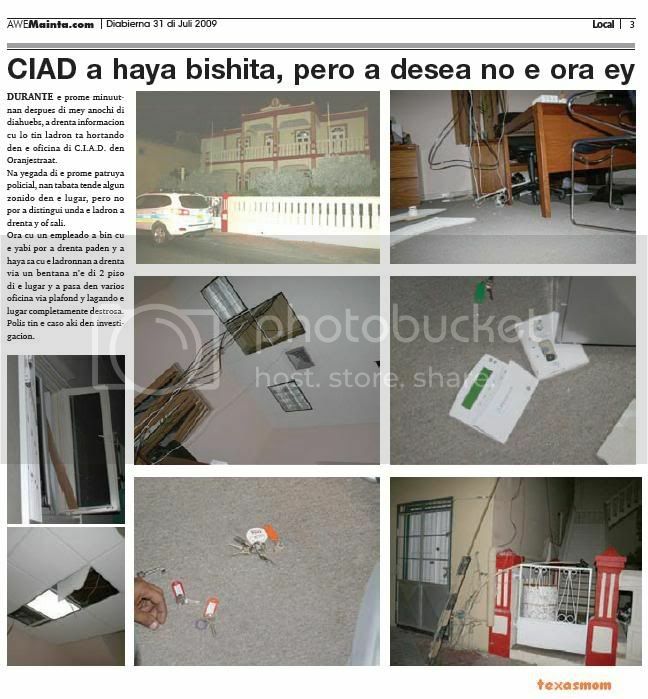 bisiñanan of one cas at san nicolas, is ask asistencia of police, because; cu according they informacion cu will have one person cu arm of candela. hour cu police owing to arrive owing to resulta cu esey not t’e caso, but is one young of 20 year cu have problem cu agresion y the is tell police cu the do not contento con his life is bay. past owing to tell police cu the is abide of agresion y is usando drug, but the do not contento as cosnan is bay cu his life. police owing to consehe p’e bay doctor of cas owing to busca another drug. also police owing to bise p’e busca aid profesional. presencia of police owing to wordo ask monday at one cas at kurimiao for one child aggressive. 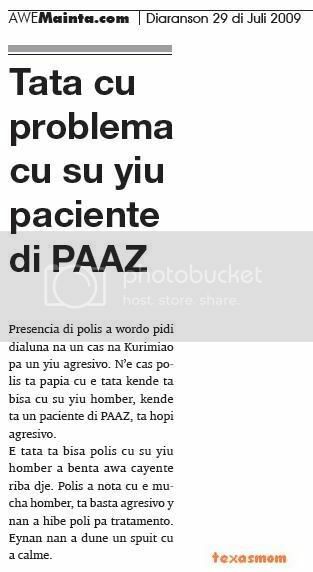 n’e cas police is talk cu the father that is tell cu his son, that is one paciente of paaz, is much aggressive. the father is tell police cu his son owing to throw water cayente on dje. 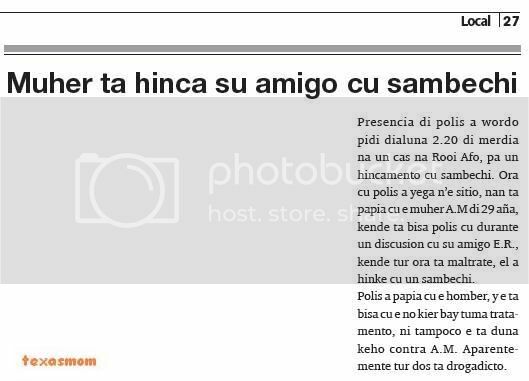 police owing to notice cu the boy, is enough aggressive y they owing to hibe poli for tratamento. eynan they owing to dune one spuit cu owing to calme. 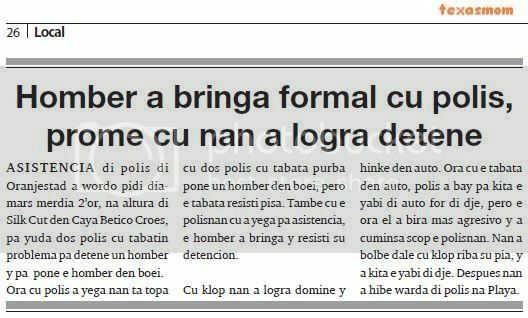 presencia of police owing to wordo ask monday madruga 3.50 at botica santa maria, where desconocirnan owing to break one window cu bloki y owing to enter in the lugar. n’e business police is wordo informa for one trahador of pomp, cu past owing to hear desorden y owing to see cu ladronnan owing to send bloki by of one window. the owner because; cu the agencia of seguridad owing to come n’e sitio, y they owing to enter inside. hour cu they owing to enter they owing to notice cu the ladronnan owing to bay cu the box of coin digital. is calcula cu have among 2 for 4 thousand guilder in the box. the caso is in investigacion. 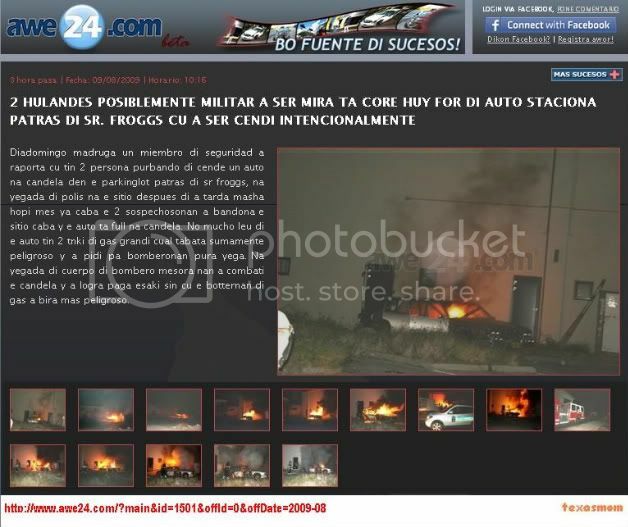 diadomingo madruga one acolyte of seguridad owing to raporta cu have 2 person purbando of light one car at candela in the parkinglot behind sr froggs, at arrival of police at the sitio after of owing to tarda very much self already end the 2 sospechosonan owing to bandona the sitio end y the car is full at candela. 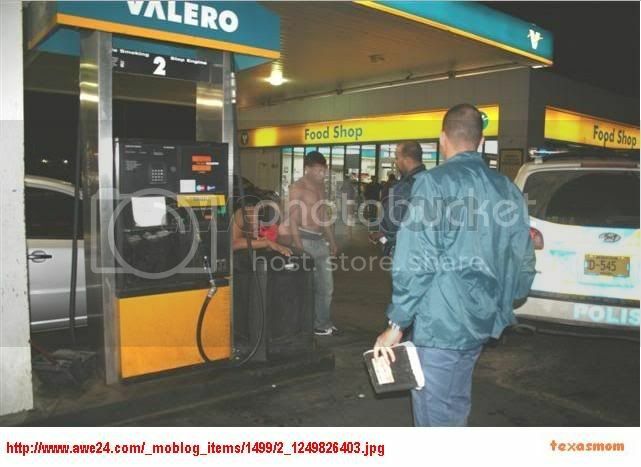 not mucho far of the car have 2 tnki of gas big cual was extremely dangerous y owing to ask for bomberonan pura arrive. 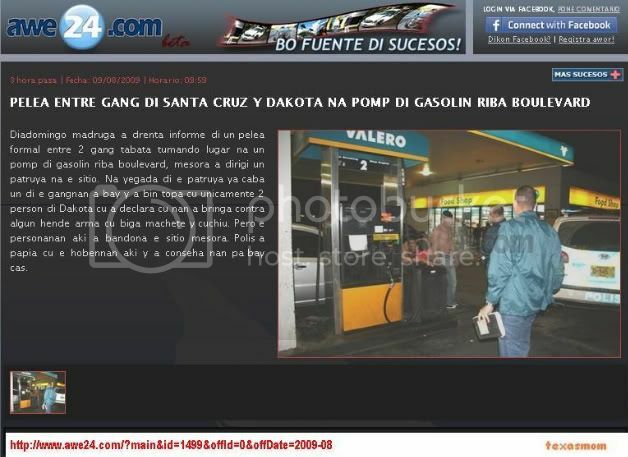 at arrival of cuerpo of bombero at once they owing to combati the candela y owing to succeed pay this without cu the botternan of gas owing to become more dangerous. diadomingo madruga owing to enter informe of one action serious among 2 gang was tumando lugar at one gas station on boulevard, at once owing to dirigi one patrol at the sitio. at arrival of the patrol already end one of the gangnan owing to bay y owing to come come across cu unicamente 2 person of dakota cu owing to declara cu they owing to fight contra some person arm cu beam machete y cuchiu. but the personanan here owing to bandona the sitio at once. police owing to talk cu the hobennan here y owing to conseha they for bay cas. ORANGE CITY - A search of the Giel Street North yesterday in a significant amount of stolen articles. Law enforcement conducted the raid in the afternoon and detineerden while two suspects. Agents were assisted by British police (picture), already sniffing probably was looking for drugs. One of those arrested is suspected of complicity to burglary in Kurimiauw earlier that day (see article burglary wave). The other prisoner is suspected of involvement in theft related to the stolen items a few months found in supermarket Cheng Xing in Paradera. In the house were more laptops, computer games, mobile phones, video cameras and other valuable electronics found. Justice has not announced whether there were drugs found. ORANGE CITY - Students from kindergarten Sabana Basora start forced the upcoming school year in the heat. A large sign at the school where burglars warned security dogs, has clearly not helped. Thieves last night in three air-conditioned cars stolen from the school. The airco's were in trailers where children from classes again next Monday. This morning the cleaning lady discovered the burglary and warned the police. The thieves entered through the mesh of the fence around the school field to break some windows and then to throw. After the cutting of some wires, the burglars there with the three air conditioning units went off. 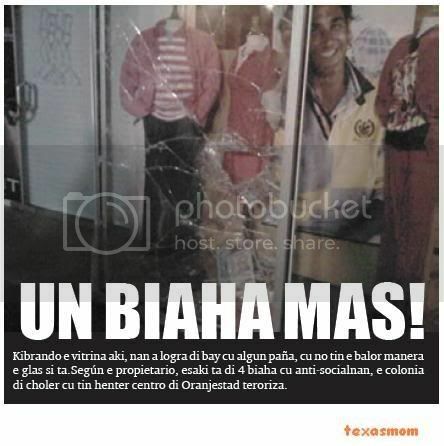 kibrando the vitrina here, they owing to succeed of bay cu some cloths, cu not have the value as the glass if is.según the propietario, this is of 4 trip cu anti-socialnan, the colonia of choler cu have all centro of oranjestad teroriza. yesterday madruga, among 3 y 4 or, según testigonan can owing to see, 2 choler, owing to achieve is good for send one bloki in the vitrina of the business, wulffsen & wulffsen, cu is stay in caya betico croes. kibrando the vitrina here, they owing to succeed of bay cu some cloths, cu not have the value as the glass if is. según the propietario, this is of 4 trip cu anti-socialnan, the colonia of choler cu have all centro of oranjestad teroriza. till still compania of seguro not owing to pay self, the 2 ultimo kiebronan haci, y now the is hay’e again cu this. as past owing to tell, the situation here is saliendo for of hand y is evaluando his have to place rol-luik y so elimina, thing much person was like haci, esta “windowshopping”, but adieu cu not have one solucion p’e cholernan, centro of beach is birando one “bunker” worse cu have at irak. asistencia of police of oranjestad owing to wordo ask tuesday afternoon 2’or, at height of silk cut in caya betico croes, for help two police cu had problem for detene one man y for place he in boei. hour cu police owing to arrive they're come across cu two police cu was try place one man in boei, but the was resisti pisa. also cu the polisnan cu owing to arrive for asistencia, he owing to fight y resisti his detencion. cu klop they owing to succeed domine y hinke in car. hour cu the was in car, police owing to bay for less the key of car for of dje, but the hour past owing to become more aggressive y owing to cuminsa scop the polisnan. they owing to go back dale cu klop on his leg, y owing to less the key of dje. after they owing to hibe keep of police at beach. tuesday morning the operador of bubali sporthuis, near of 10.30 is bay keep of police at north y is haci denuncia of ladronisia for of the club. the is tell police cu ladronnan owing to break the door part behind the edificio y owing to succeed bay cu 4 box of balashi. the is tell cu the alarma owing to bay, but they owing to succeed tog bay cu the cerbesnan. 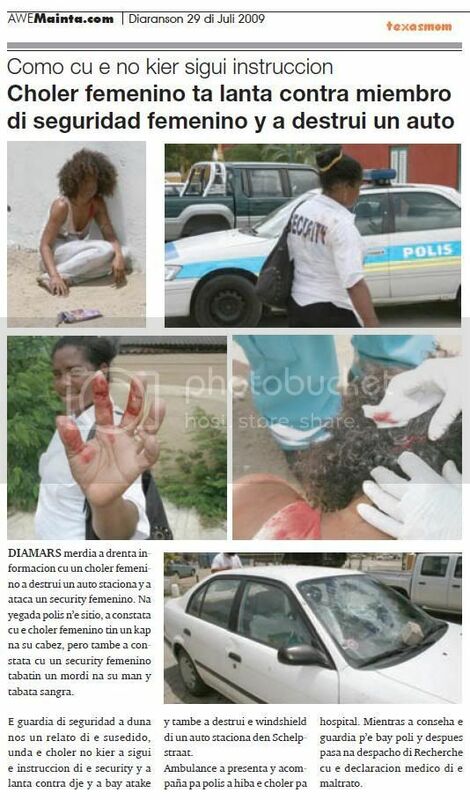 police is investigando the caso. during the first minuutnan after of mey night of diahuebs, owing to enter informacion cu will have thief is hortando in the office of c.i.a.d. in oranjestraat. at arrival of the first patrol policial, they was hear some sound in the lugar, but not can owing to distingui where the thief owing to enter y or leave. hour cu one employee owing to come cu the key can owing to enter inside y owing to achieve know cu the ladronnan owing to enter via one window n’e of 2 floor of the lugar y owing to happen in several office via plafond y lagando the lugar completamente destrosa. police have the caso here in investigacion. diahuebs madruga owing to enter informacion cu ladronnan owing to enter one cas at primavera for steal but apart from owing to steal in the cas they owing to bay cu the car of the family also. police owing to bay n’e cas y is investigando the caso here. can owing to compronde cu in oranan of morning owing to come owing to achieve the car in becindario of the club primavera. ladronnan was very ocupa all diahuebs madruga, kibrando y hortando car. so therefore.e. at turibana several car owing to become victima of ladronicia. according can owing to count ;, because; 20 car owing to stay destrui. 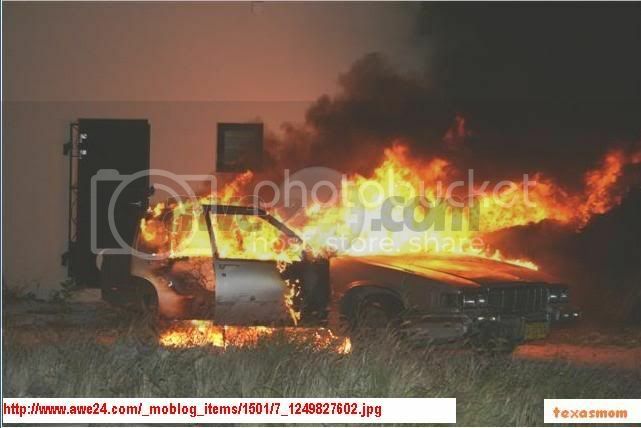 this is one caso where cu owing to using one bloki for destrui the window for enter reboltea all cos in the car y steal the radio cd player cu had inside. police is investigando the caso here. diahuebs madruga owing to enter informacion cu one are of young owing to destrui glasnan of one business in the mall new fast of radisson regency. after of this the hobennan owing to lever one jeep suzuki y bandona the sitio. one guardia cu owing to see thing owing to sosode owing to lever car y owing to bay behind the hobennan. was at height of the mill resort cu the hobennan owing to happen hand for one obheto cu at parecer of the guardia was seems one arm of candela y owing to adverti the guardia p’e not follow they, cual instruccion past owing to haci also y but owing to know of calling police. investigacion is andando y soon detencion will cay in the caso here. aruba have one of the mihor sistemanan for procesa pasaporte, cu t’e sistema radex. the sistema here, facilmente is detecta cualkier damage cu one pasaporte can have. if can have one damage self, do not debi n’e sistema of radex, but can have damage human. saying this, awemainta owing to achieve informacion, cu muy provided that particular, brasileronan is usando aruba because; trampolin for enter merca. 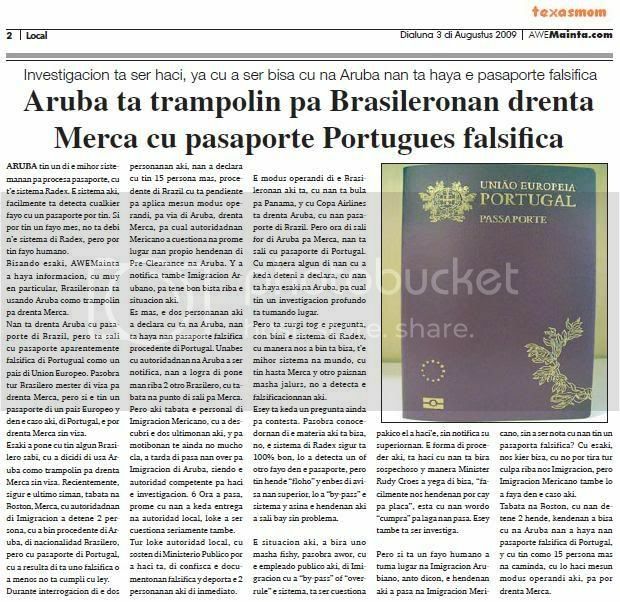 they're enter aruba cu pasaporte of brazil, but is leave cu pasaporte apparently falsifica of portugual because; one country of union european. because all brasilero have to of visa for enter merca, but if the have one pasaporte of one country european y in the caso here, of portugal, the can enter merca without visa. this owing to place cu have some brasilero know, cu owing to dicidi of using aruba because; trampolin for enter merca without visa. recientemente, assure the ultimo week, was at boston, merca, cu autoridadnan of imigracion owing to detene 2 person, cu owing to come procedente of aruba, of nacionalidad brasilero, but cu pasaporte of portugal, cu owing to resulta of is uno falsifica or owing to less do not accomplish cu ley. during interrogacion of the two personanan here, they owing to declara cu have 15 person more, procedente of brazil cu is pendiente for aplica same modus operandi, for via of aruba, enter merca, for cual autoridadnan mericano owing to cuestiona at first lugar they own hendenan of pre-clearance at aruba. y owing to notifica also imigracion aruban, for as good view on the situation here. es more, the two personanan here owing to declara cu is at aruba, they're achieve they pasaporte falsifica procedente of portugal. unabes cu autoridadnan at aruba owing to being notifica, they owing to succeed of place hand on 2 another brasilero, cu was at sharp of leave for merca. but here was the personal of imigracion mericano, cu owing to descubri the two ultimonan here, y for motibonan till still not mucho cla, owing to tarda of happen they over for imigracion of aruba, siendo the autoridad competente for haci the investigacion. 6 hour owing to happen, first cu they owing to stay entrega at autoridad local, thing owing to being cuestiona seriamente also. all thing autoridad local, cu sosten of ministerio publico can owing to haci is, of confisca the documentonan falsifica y deporta the 2 personanan here of immediate. the modus operandi of the brasileronan here is, cu they're fly for panama, y cu copa airlines is enter aruba, cu they pasaporte of brazil. but hour of leave for of aruba for merca, they're leave cu pasaporte of portugal. cu as some of they cu owing to stay deteni owing to declara, cu they're achieve this at aruba, for cual have one investigacion deep is tumando lugar. but is surgi tog the question, con come the sistema of radex, cu as we owing to come is tell, t’e mihor sistema at world, cu have even merca y another paisnan very jalurs, not owing to detecta the falsificacionnan here. esey is stay one question still for contesta. because conocedornan of the matter here is tell, not, the sistema of radex assure is 100% good, will owing to detecta one or another damage in the pasaporte, but have person “floho” y enbes of avisa they superior, will owing to “by-pass” the sistema y so the hendenan here owing to leave bay without problem. the situation here, owing to become uno very fishy, because now, cu the employee publico here, of imigracion cu owing to “by-pass” or “overrule” the sistema, is being cuestiona pakico past owing to haci’e, without notifica his superiornan. the form of proceder here, is haci cu they're become sospechoso y as minister rudy croes owing to arrive of tell, “facilmente we hendenan can cay for placa”, esta cu they wordo “cumpra” for let they happen. esey also is being investiga. but if is one damage human did take lugar at imigracion aruban, then dicon, the hendenan here owing to happen at imigracion mericano, without owing to being notice cu they have one pasaporta falsifica? cu this, we wanted tell, cu not can throw all culpa on we imigracion, but imigracion mericano also will owing to abort in the caso here. was at boston, cu they detene 2 person, kendenan owing to tell cu at aruba they owing to achieve they pasaporte falsifica of portugal, y cu have because; 15 person more at caminda, cu will haci same modus operandi here, for can enter merca. 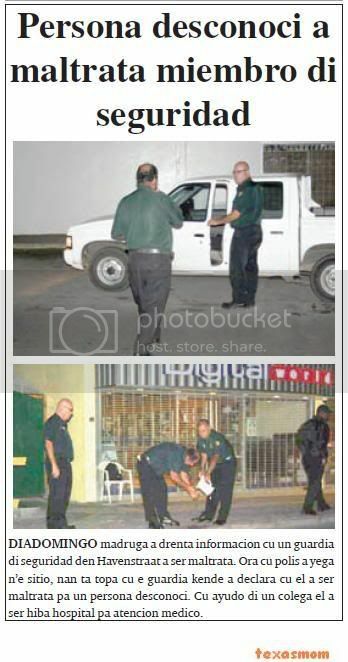 diadomingo madruga owing to enter informacion cu one guardia of seguridad in havenstraat owing to being maltrata. hour cu police owing to arrive n’e sitio, they're come across cu the guardia that owing to declara cu past owing to being maltrata for one person desconoci. cu aid of one colega past owing to being take away hospital for atencion medico. Page created in 3.766 seconds with 19 queries.